When extraction is needed, see an experienced oral surgeon for the best results. Don't put up with painful teeth when we can help. For the most part, just like your general dentist, our goal is to help you preserve your healthy teeth for a lifetime. Sometimes, though, teeth can become a problem and seriously affect both the health of your other teeth and even your overall health. In these situations, it’s important for those teeth to come out. 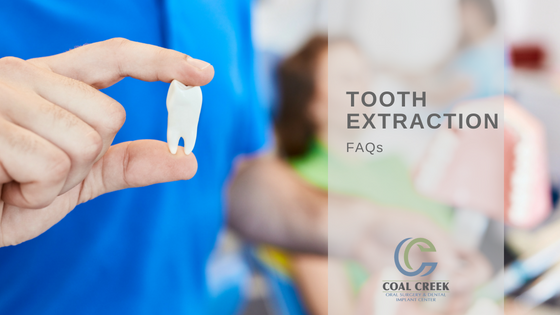 At Coal Creek Oral Surgery and Dental Implant Center, we can extract any tooth that has become a problem. General dentists in and around Lafayette, CO trust our practice to provide outstanding surgical care to their patients, including tooth extractions. Teeth can develop serious problems at any age, from childhood all the way through adulthood. 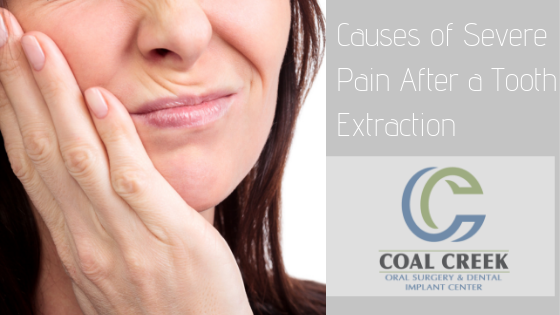 Impaction is a common problem that requires extraction. Teeth are described as impacted when they fail to properly erupt through the gum tissue. This might mean that they have only partially erupted (a common situation for wisdom teeth, or third molars) or they simply never broke through the gum tissue at all. Both problems increase your risk for infection and decay since it is impossible to properly clean impacted teeth. Your comfort is one of Dr. Hayes’s highest priorities. We provide anesthesia when necessary, and we can even provide sedation for children. In some cases, this may mean that treatment will be performed at the hospital. Since we can effectively plan treatment using our advanced imaging techniques, we’ll be able to let you know what to expect. For most people, just knowing the plan is enough to help calm anxiety and fear! The compassionate nature of Dr. Hayes and our team and our commitment to your comfort also provides our patients with a great deal of reassurance. 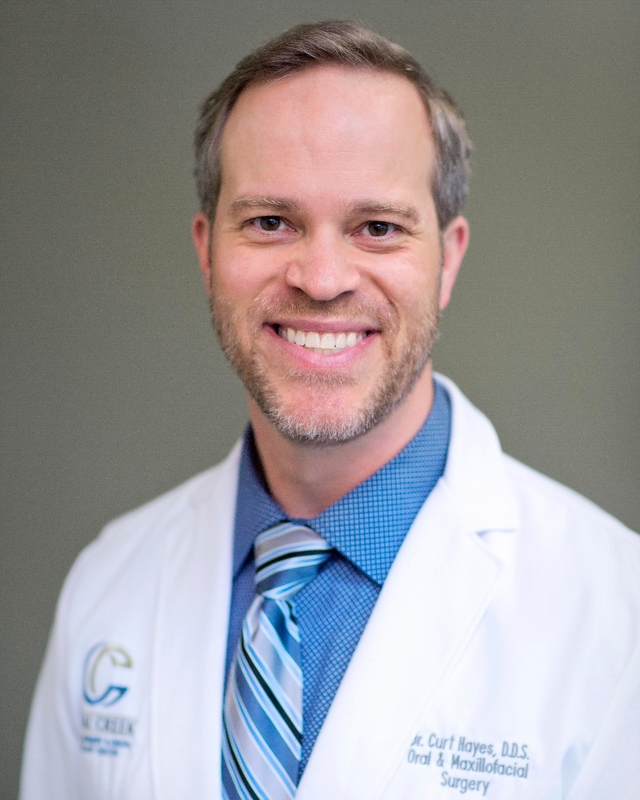 Dr. Hayes will provide you with all the details you need to properly care for the site following your procedure for the best possible healing and a minimal risk of discomfort or complication. While a general dentist can perform simple extractions, an oral surgeon has the extra skill and training required to complete even the most complex extractions. Because of the size and location of the wisdom teeth, this procedure can be particularly complex. For the best results and proper healing, please contact our Lafayette oral surgery practice to schedule your evaluation with Dr. Hayes. If you are prescribed medication, be sure to take the medication exactly as directed and ask Dr. Hayes or your pharmacist if you have any questions. Don’t probe the extraction site with your tongue – or anything else for that matter! It is likely to be tender, and you can dislodge the clot, which is necessary for proper healing. Eat soft foods while you are healing and avoid chewing on the same side of your mouth as your extraction site. Don’t drink liquids through a straw. The sucking action can dislodge the clot. If you smoke, please let us know. Smoking affects the rate of healing and, as with a drinking straw, the sucking action can dislodge the clot. Having a tooth pulled for the first time can be a scary experience. We understand that no one really enjoys having dental work done. Hopefully knowing more about what to expect will help to put you are ease. Here is some basic information about dental extractions that will help answer questions and concerns you may have related to your appointment. If you’re experiencing tooth pain, you should see an oral surgeon. Louisville residents can reach out to Coal Creek Oral Surgery and Dental Implant Center for assistance. Dr. Curt Hayes will evaluate the condition of your tooth and provide you with a treatment plan. Will it Hurt to Get My Tooth Pulled? Many patients fear that getting a tooth extracted will be very painful. You can rest assured knowing that your comfort is of utmost importance to us. We will thoroughly numb the area to ensure you do not experience any pain during the procedure. If you are prefer to be conscious, you may notice some pressure, but the anesthesia will eliminate discomfort. Our office does offer IV sedation and is used in most cases. Our highly trained specialist and team will discuss this option with you to ensure that you understand what to expect. Feel free to ask any questions you may have! Can Tooth Extraction Cause Bad Breath? Carefully following your post-operative instructions is essential for a smooth healing process. Though the area may experience some soreness while brushing your teeth, it should still be done regularly after it has initially healed. Gently rinsing with a warm salt water solution will help keep the extraction site clean and free of bacteria that cause bad breath. If you notice a foul odor along with drainage from the area after having oral surgery, Louisville specialist Dr. Hayes will need to see you right away. You may have an infection and need to take an antibiotic to get it cleared up. Can Tooth Extraction Affect Sinuses? On the upper jaw, the roots of our teeth can be close to, or extend into the sinus cavity. If one of them requires an extraction, it should be performed by an oral surgeon. Louisville specialist Dr. Hayes will take extra precaution to ensure that your sinus cavity remains intact. This is important and will avoid side effects like a sinus infection, nosebleed, or more serious problems. If you were told or think you require oral surgery, Louisville expert Dr. Curt Hayes and his staff would love to meet you. Give us a call today at Coal Creek Oral Surgery and Dental Implant Center to schedule a consultation. If your dentist has recommended an extraction, please ask for a referral to Coal Creek Oral Surgery and Dental Implant Center. Not only will you be treated by an expert in the field, we can also help plan for the future and discuss replacement options if needed. We'll help restore your comfort and your health..